With all the unique people and places on our planet, there is one thing that each one of us share and it defines where we come from, food. One of the first ways we get to know and understand other cultures is through their seasonings, spices, plate combinations and savory ingenuity. When it comes to the United States, food is a collaboration of ethnicities making it the melting pot of the culinary world. When people think of our traditional foods, they think fried, greasy, southern, Cajun or fast. So just how do we enjoy the cuisine of our country without packing on the extra pounds? First up, pizza, originally from Naples, Italy and now the calling card of New York City and Chicago. 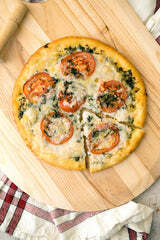 To make this date night classic into a healthier meal, you have to start from the crust. The base can be made from cauliflower, flax seed and chia, sweet potato, squash or zucchini, eggplant or nuts and seeds. When it comes to toppings, the options are endless! Stick with tons of vegetables and try some new ones like cashew cream or nut and soy based cheeses. If you need some inspiration, try Veestro’s Pizza Napolitana! When headed down south, it’s fried, fried and more fried! Fried okra, fried squash,fried green beans, not to mention fried chicken and chicken fried steak, which oddly isn’t chicken. So how do you takethe flavors of the south and make them nutritious? Here’s a shocker: according to a new study in Granada, Spain frying vegetables in olive oil is actually healthier than boiling them! Now what about the breading? Ground flax seeds or chia seeds make a tasty and nutritious, crunchy coating. Depending on the food, dried coconut makes a sweet breading. As for all the fried meats, crushed, roasted nuts packed around a portobello mushroom or a thick slice of eggplant make a winning combination! 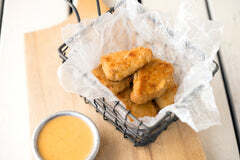 Give Veestro’s Chick’n Nuggets with Chipotle Dip a try. Another American classic is meatloaf with mac n cheese. I know you’re thinking this is a dish that can’t be made healthy, but you’re wrong. Meatloaf may be one of the easiest converts to a Veggieloaf without any loss in flavor! 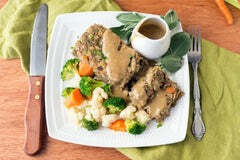 Try Veetro’s Lentil Meatloaf and then mix and match for your own. Nearly any bean will be a good start, but also play around with sweet potatoes, tempeh or mushrooms. As for mac n cheese, there’s only one thing to say, cashews! A little nutritional yeast gives a great cheesy flavor too!Nothing says breakfast like a plate of biscuits and gravy. But wow with those calories, you’ll need to fast for the next 48 hours! Next time the craving hits, whip up a mushroom gravy with almond or rice milk, a little vegetable broth, the flour of your choice and load in the savory bulbs, roots and spices. Mix up your favorite biscuit recipe with a little almond milk and ghee or coconut oil. This classic dish will not disappoint!We could go on with so many more like a BLT whose alternate is the ALT, avocado, lettuce and tomato lightly splashed with Worcestershire sauce, or mashed potatoes creamed up with garlic, rice milk and olive oil. Beans versus no beans chili of the north and chili of the south filled with roasted peppers and rough chopped mushrooms. And still we could go on, but instead we suggest taking a look at all the classic American meals Veestro has to offer. There’s no reason you can’t enjoy the food you love! Happy eating!